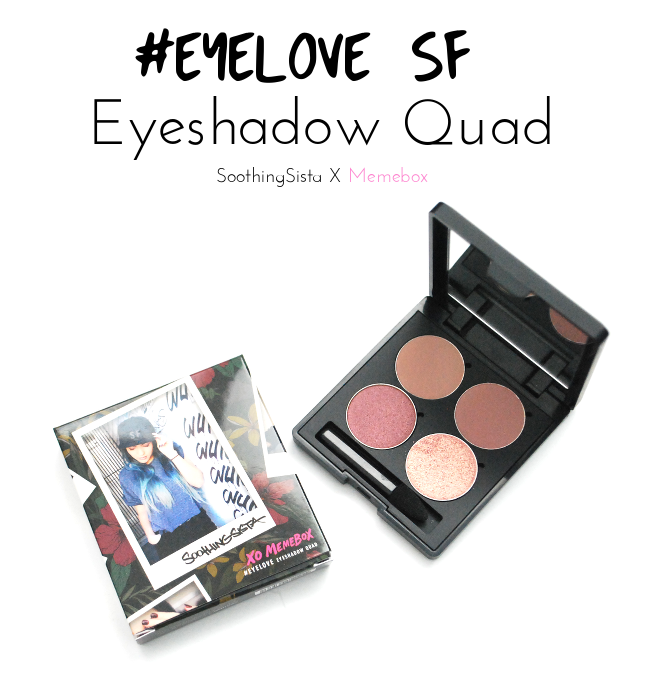 Description: #eyelove SF Eyeshadow Quad includes essential colors of rose-hued neutrals that create versatile looks. 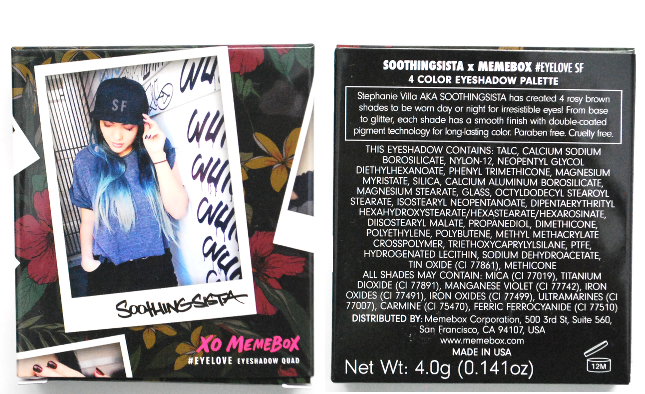 SOOTHINGSISTA named each color after her favorite places of San Francisco, California. 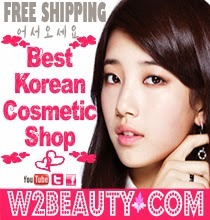 Long-lasting, blendable formula with double coated technology. Paraben free. Cruelty free. Here you have Stephanie looking effortlessly chic on the front of the box. The packaging for this case definitely has a more Western feel to it rather than Korean. It's a simple matte black case made of plastic with a well-sized mirror on the inside. Maybe it's just me, but the round eyeshadow pans with the black case kind of reminds me of MAC's packaging. Since it's very lightweight and compact, it's great for carrying around in your purse, bag, etc. A sponge applicator is also included in the case. The shape of the sponge is a lot sharper than most applicators, which makes it a lot easier for a precise application in my experience. It's a decent applicator in my opinion, but I'm not really picky when it comes to these things. Even though I've been to SF a good number of times I admit I've never heard of these places other than "Bae Area" (or "Bay Area", another name for the region surrounding SF). If you watch Stephanie's video here I think she mentions what the places are. I absolutely LOVE neutral eyeshadows, and these four shades are no exception. Sutro is a light dusty brown color with a hint of rose. It looks great as a base or on its own. Valencia is more pink than Sutro and looks a little richer too. It works well on its own, but can also be used as a base. Personally I find myself reaching for Sutro more often if I only want to use one shade, and for Valencia if I plan to blend it with other shades from this quad. Candy Rain is a shimmery metallic rose color that looks really pretty and blends in beautifully with Valencia. Bae Area is probably my most favorite out of the bunch! It's a rose-gold glitter shadow that leans more pink than gold. 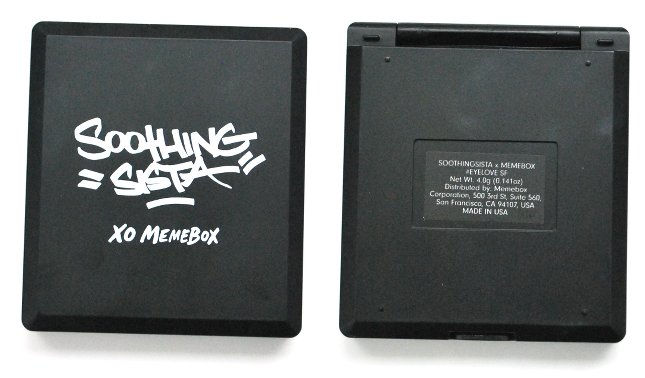 The one thing I dislike about this though is that it's flaky, which means there will be fallouts in the case. I really like this quad. 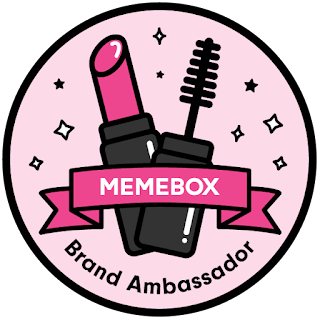 I think Stephanie and Memebox did a great job with the formula and colors, other than Bae Area which could have a better formula. Perhaps finer glitter particles would have helped? Other than that the other three shades have a really nice formula that are fairly long-lasting and have no fallouts. All four shades blend easily into a smooth finish and do not crease. Some might find the pigmentation a little lacking, but I personally prefer less pigmented shadows. What's great about these four rosey-hued neutrals are that they're really versatile. 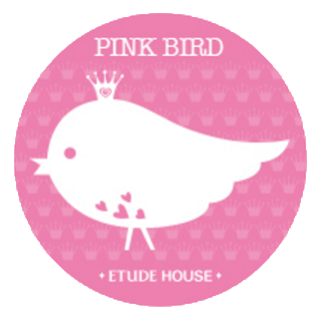 You can use them for daily wear, parties, formal occasions, etc. I'll leave the fancy stuff to the more experienced eye makeup users however, since I'm still an amateur myself. Maybe one day I'll get to the point where I can figure out how to blend and mix 5 different shades together on one eye, but for now baby steps. 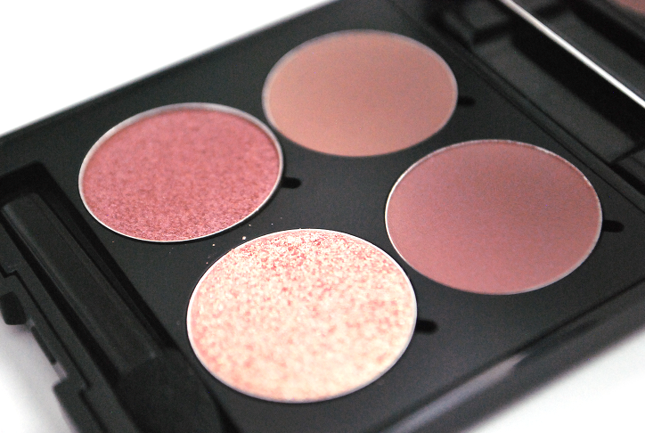 I would suggest anyone who is a fan of neutral colors to give this eyeshadow quad a try. The colors are really beautiful and the formula is great considering how inexpensive the quad is. Honestly I don't think anyone would dislike this quad, but if you already own something like the Naked 3 Palette then there's no need to purchase this. What do you guys think of this quad? Have you ever been to San Francisco and any of the places the shades are named after? Hopefully I'll be able to post another review this week! Bae Area is my favorite too. I definitely get some fallout from it, but it's so pretty I don't care! My thoughts exactly! I actually got a compliment on it once, and that hardly ever happens. It's such a pretty color the fallouts are bearable. 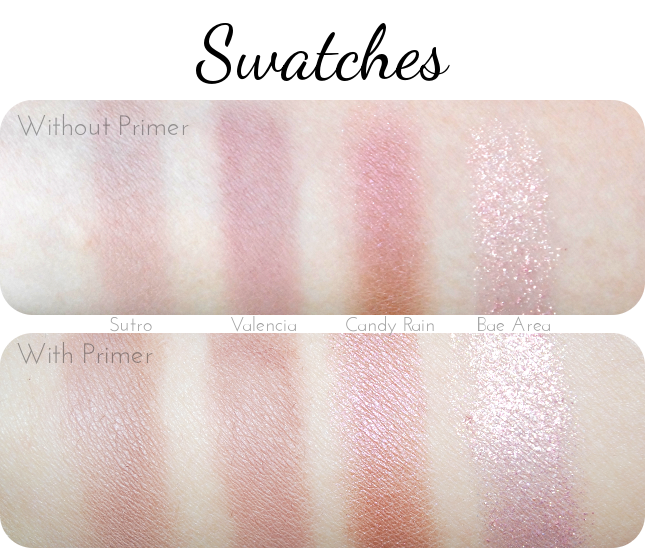 I've seen this being reviewed a couple time now and I would love to have the middle two shades that you swatched!! Love these rose tone browns! So gorgeous and easy to wear! looks like the bae area color is the most glittery ,love it!looks perfect to use it on special occassion! This seems like such a nice neutral palette! I don't really like the packaging for the box tho, it seems quite cheap (maybe because of the flowers on the BG lol) and it feels like the price could be cheaper than $17. I've never been to San Francisco, let me fly there and make you bake me some cookies, lol jk. Haha. As always, nice review Gloria! I agree, rose tone browns seem to look great on anyone and with anything! Just found your blog :) Great review!